Enjoying the light play during the construction meeting today. The board, architects, and contractors reviewed recent progress together as we are compiling a final punch list to draw the long construction process to a close. Soon we will be in the building running programming. Finishing touches are underway. This week picking colors for the wood panels, final cleanup in the tenant space, and paint for the rear wall of the building are all complete. We’re not there yet but the final vision is really showing through. The panels for the ceiling have been delivered and are currently being installed. The 40-piece construction is comprised of 10 panels, with 4 pieces each, installed along the steel beams. The cuts reveal a glimpse of the wood between panels. The installation is tedious and time consuming. The new ceiling conceals the structure and plywood underneath that levels the two ceiling heights—one of the original building and the other of the extension on the Avis side. Freddy works at night to install the parts of the mural that enter the interior space. They will be visible from the main programming area inside the building as well as from outside. Especially at night. Diseños returned to the site today to install the screens, completed after several rounds of sample installations and feedback. 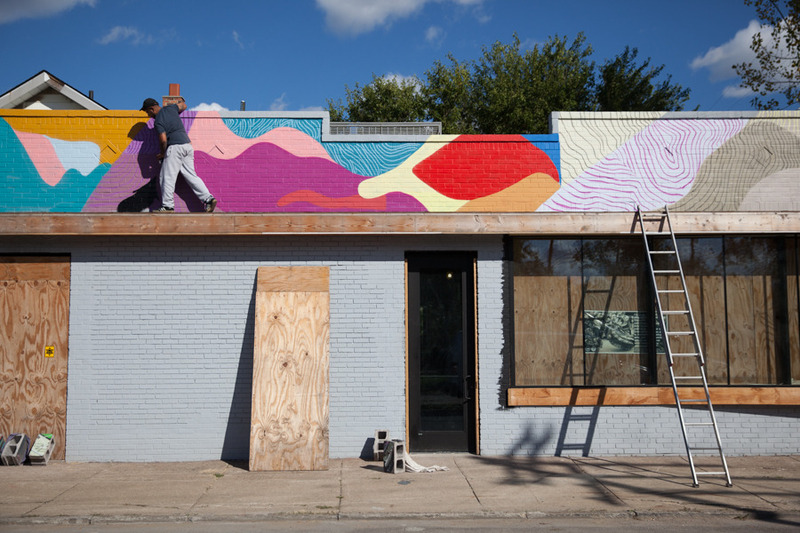 The finished product honors and will interact with the mural installed on the building as it complements the style and line work of Tead’s graffiti art. The screens will also cast a beautiful shadow across the interior of the building and on the shades as a result of the amount and direction of light the building receives each day all year long. 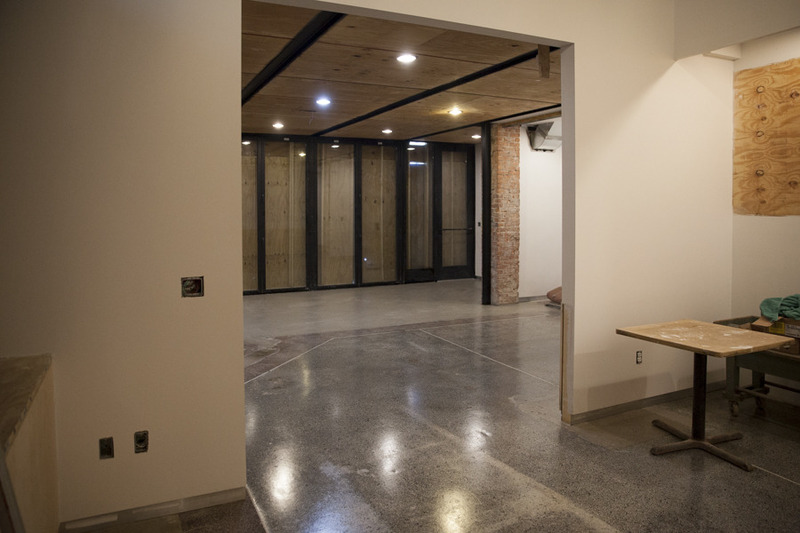 Diseños completed the installation of the interior screens in the tenant space and in our office. They frame Elsmere as we look out from the inside of the building. Also we now have a glimpse of the shadows they cast that will become a signature part of dusk here at the building. 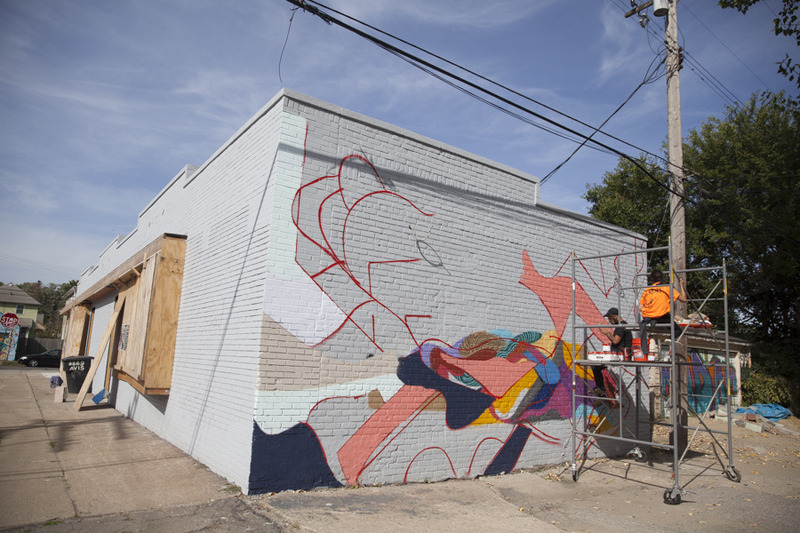 Freddy has taken advantage of the great Fall weather over the past 3 days to make considerable progress on the mural installation from the alley to the corner. The work here is inspired by a style of Tead’s gallery work that he was developing over the past several years. It is wrapping the building and will eventually also appear in the building’s interior. Freddy is laying this down as a foundation that will interact with work inspired by Tead’s various street styles. The past few days have included finishing touches to set and insulate the glass as well as the construction and installation of the shelves in the office/work area. Details and finishings are being worked on every day at the building. Plywood panels have been cut and are being sealed and installed along the bottom half of the wall on our side of the building. Some will be painted eventually while others will remain a natural wood finish. Doorways and trim are being painted, the bathrooms are getting finishing touches, and the exterior brow trim has arrived and will be installed soon. 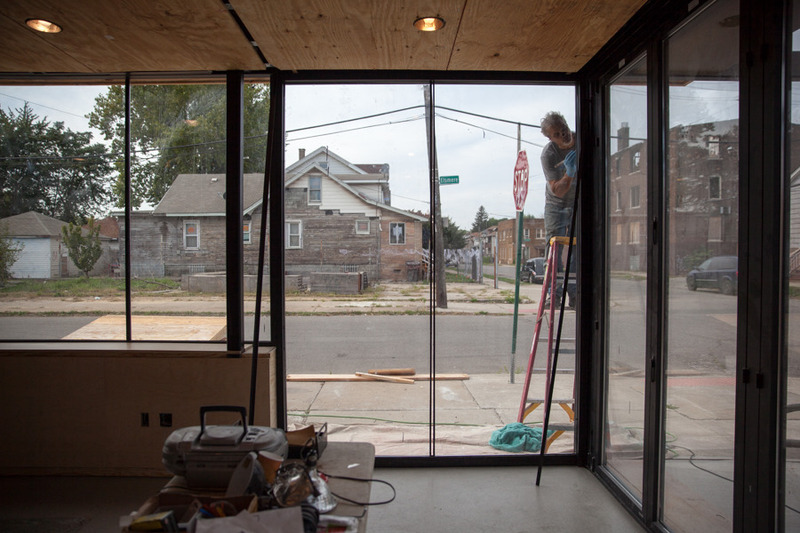 Culture Lab Detroit hosted a luncheon and conversation with food served by Flowers of Vietnam at 8869 today as construction on the space continues. Jane Schulak of Culture Lab and George Azar of Flowers were both excited to see and be in the space doing what they love. 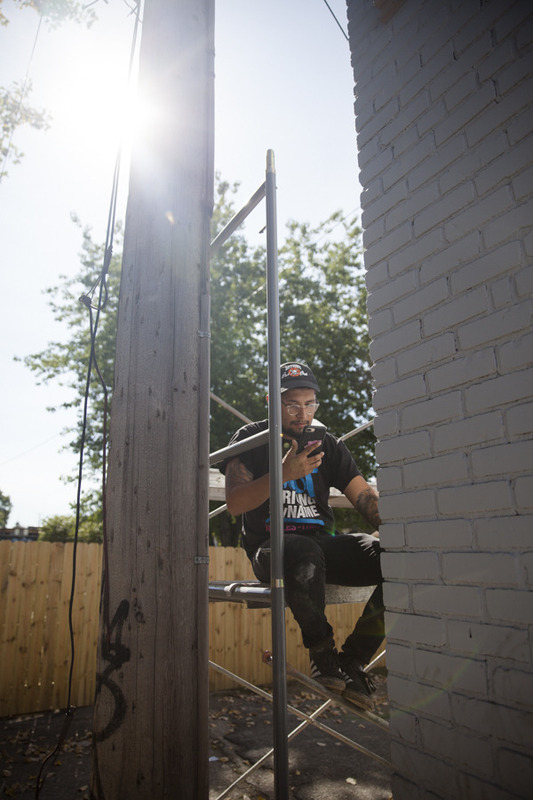 George, being from Southwest Detroit, has been interested in the work and wants to stay updated and involved as construction is completed and programming continues in the space. 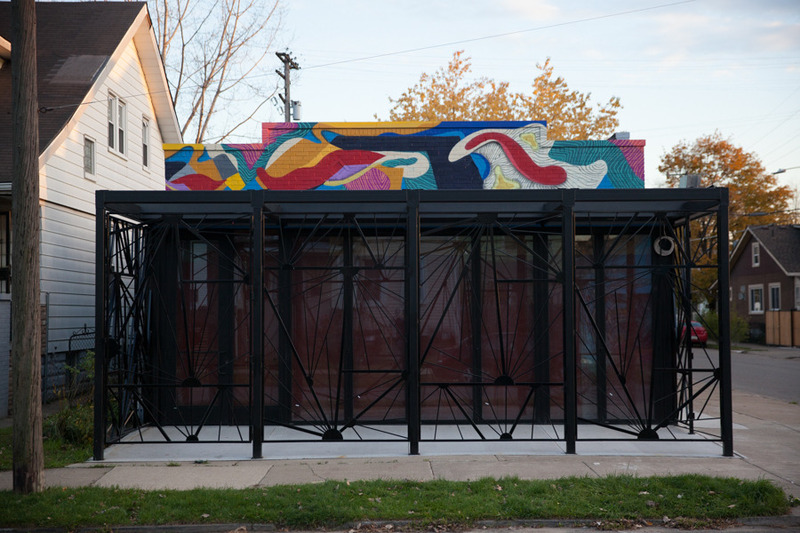 Culture Lab made a generous donation to the organization to say thank you and to support the work being done on the corner of Avis and Elsmere. Work on the mural continues. Freddy turned the corner today to begin the background on the Elsmere side of the building. The work will progress quickly over the next few days as long as the rain stays away during the daylight hours. Weather has already impacted the time available to work on the mural a bit, but neighbors have been stopping by to ask questions and check in on the progress. 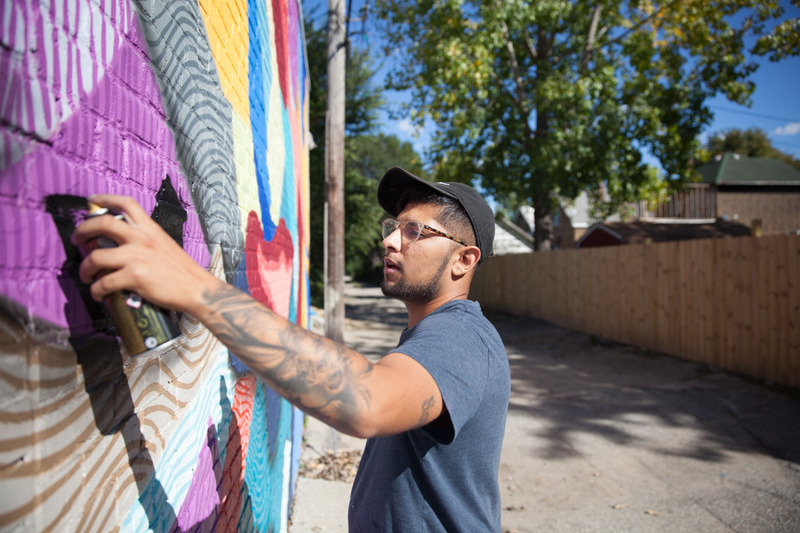 Visitors from the annual Christian Community Development Association (CCDA) Conference, taking place in Detroit this week, tour The Alley Project with community partner and host Raul Echevarria from Urban Neighborhood Initiatives. 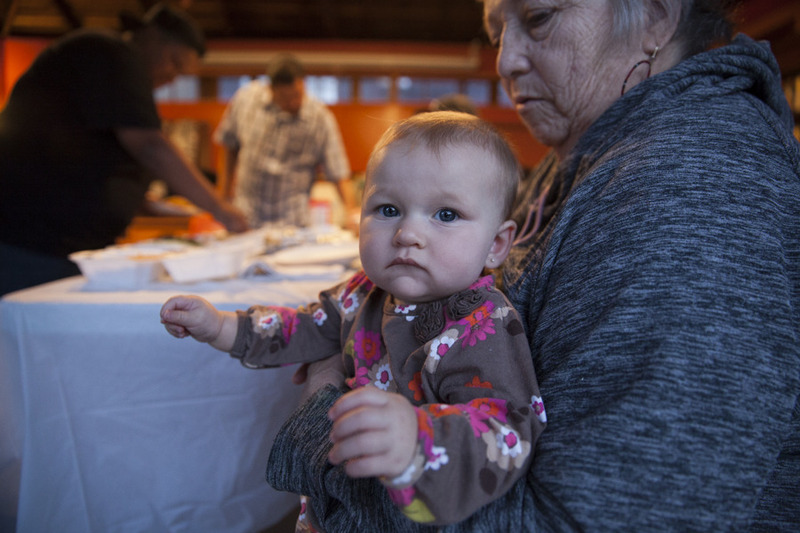 Neighbors gathered at the building on Elsmere and Avis tonight to preview the construction updates and share a meal while visiting with each other. Each week various neighbors have been coming to the building and walking through the space to see the progress happening inside. 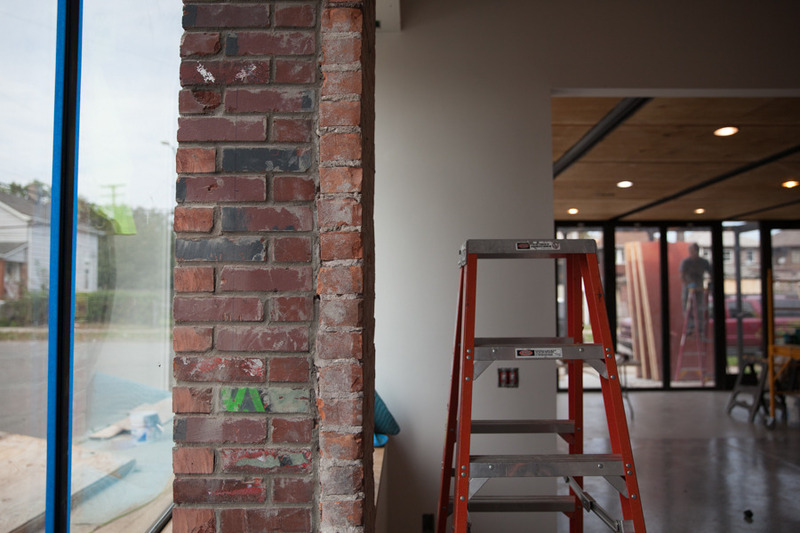 Resident sneak peeks, walk throughs, Q+A, text message updates, and photos on the blog have helped to keep people up to date with what’s happening in the building. down the street from their own home. When the building opens and events are happening on a regular basis visitors will be a more regular occurrence. 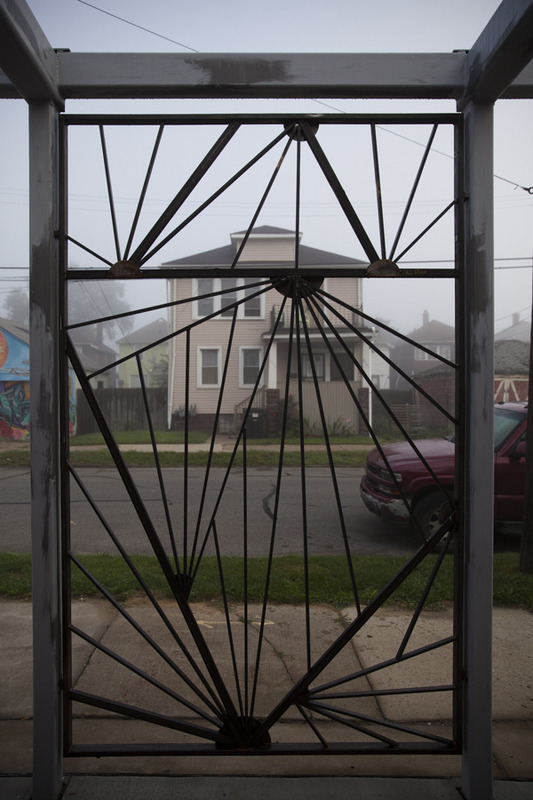 Our hope is that our informed/engaged neighbors are aware of what’s happening down the street from their homes and that they are proud of being gatekeepers of information through their involvement in the building development’s processes. Today Freddy began outlining the mural on the south facing (alley) wall. With scaffolding, aerosol, and brush paint he is starting to lay out the mural’s background from top to bottom and across the building. This background will eventually cover three sides of the building and parts of the building’s interior. Additional layers will be added to the mural at different points across the mural. 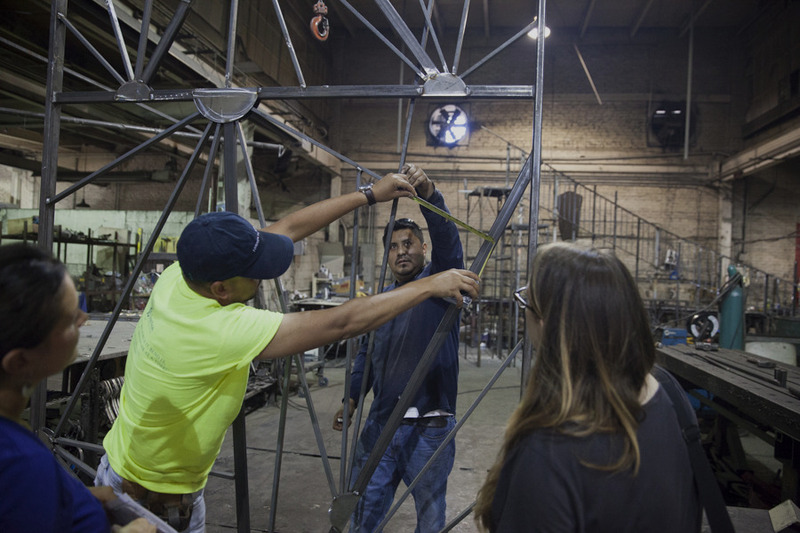 Diseños Ornamental Iron is using the template completed last week to fabricate the rest of the panels for the patio and the windows. 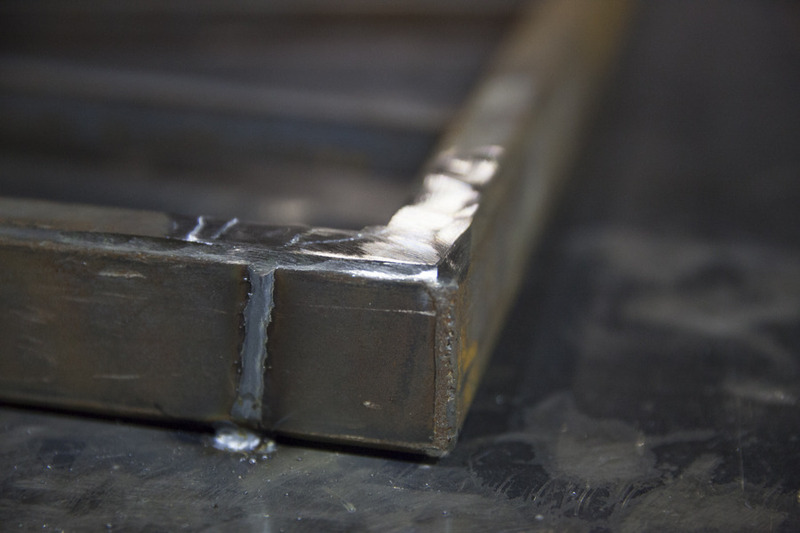 Measuring, cutting, welding, grinding and smoothing repeatedly are all part of the labor intensive process that comes after design. This will bring the vision from an idea to the beautiful, artistic iron that will eventually be installed around the building. Audio/Visual systems, ceiling finishes, and other miscellanous decisions are being discussed and scheduled for the final weeks of construction. 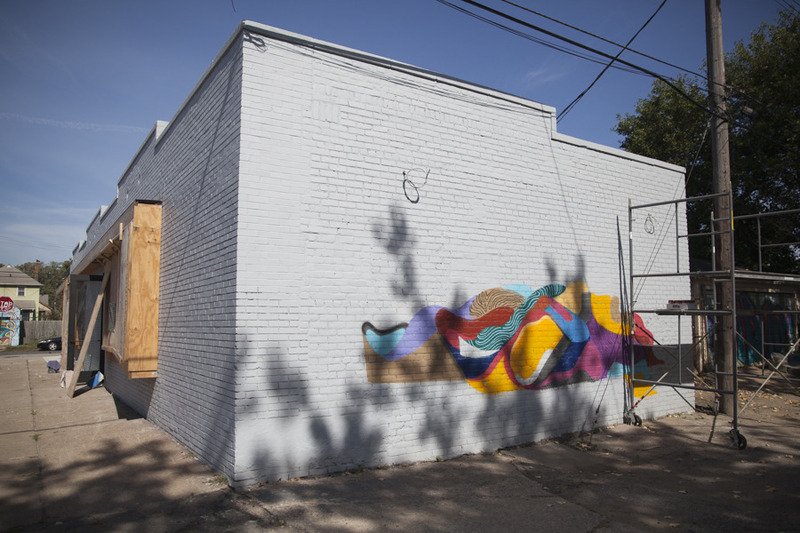 This week Freddy applied a color test to the alley side of the building to see how the color palette for the mural would look on the building. 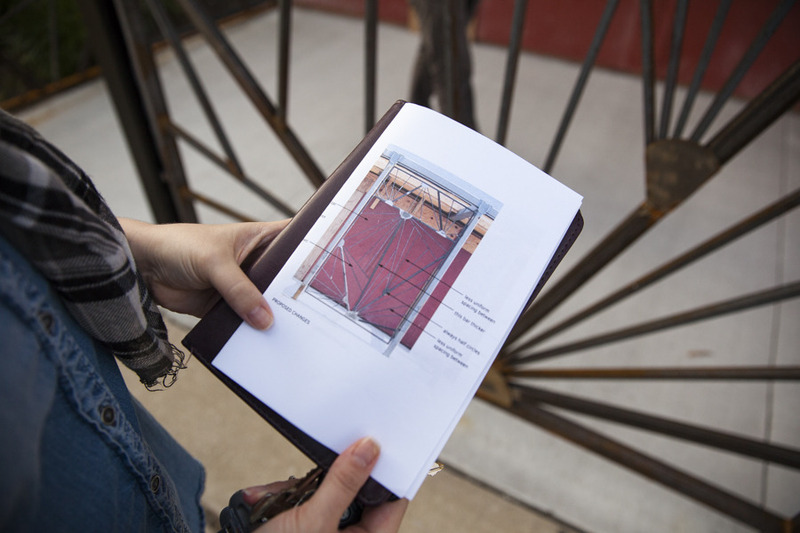 During the construction meeting they talked about concepts and Freddy shared markups that show a combination of styles inspired by Tead’s gallery work and his street work. The building will incorporate a fusion of those and Freddy’s work as a tribute to Tead’s vision for the building as well as his contributions to the scene and to individuals that he has influenced, including Freddy. 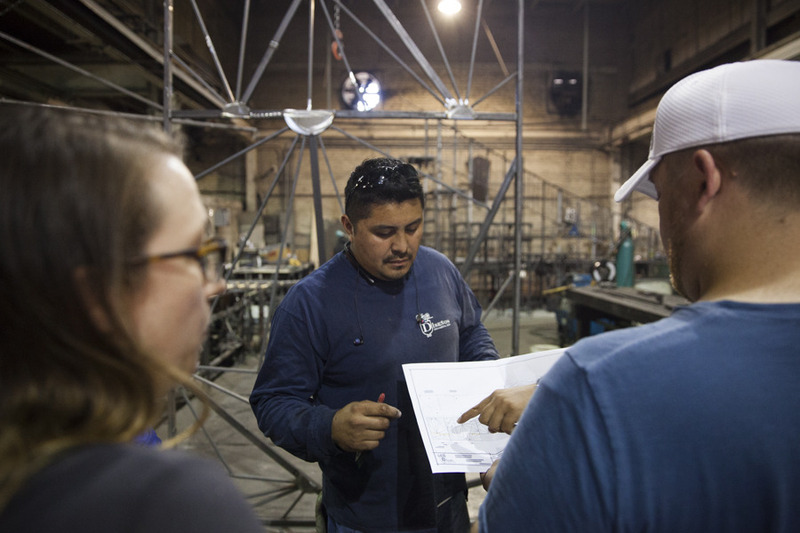 The construction team met with Diseños at their shop on Waterman to go over final revisions to the panels. When the panel is complete it will serve as a template for the other panels to be created from. Each panel is a combination of 2-3 designs that will repeat at different configurations across the patio, over the windows, and inside the rest of the windows at the building. 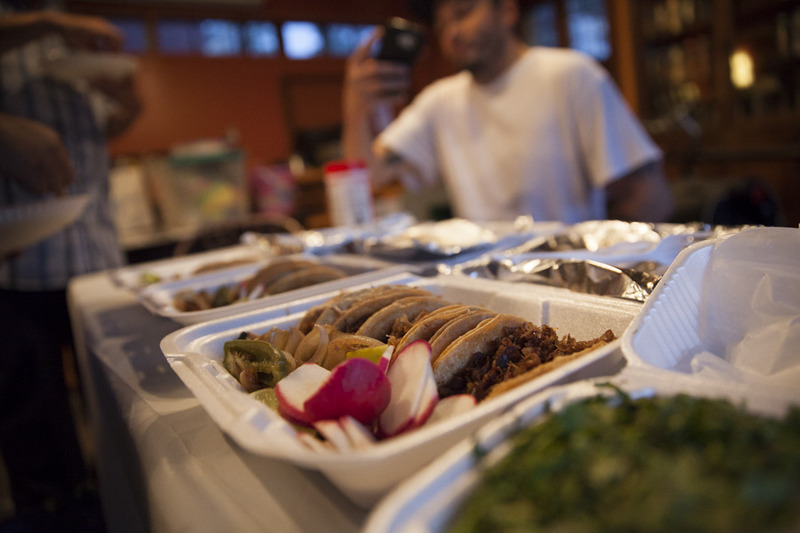 TAP’s Curator Committee got together for the first time this evening at #StudioLuevanos with tacos from #CaminoReal on Lafayette and Central. Much respect to the artists who are sharing their time and talents to further the mission and beautify the spaces of The Alley Project. A second sample panel was installed by Diseños incorporating feedback from the first panel in design and construction. 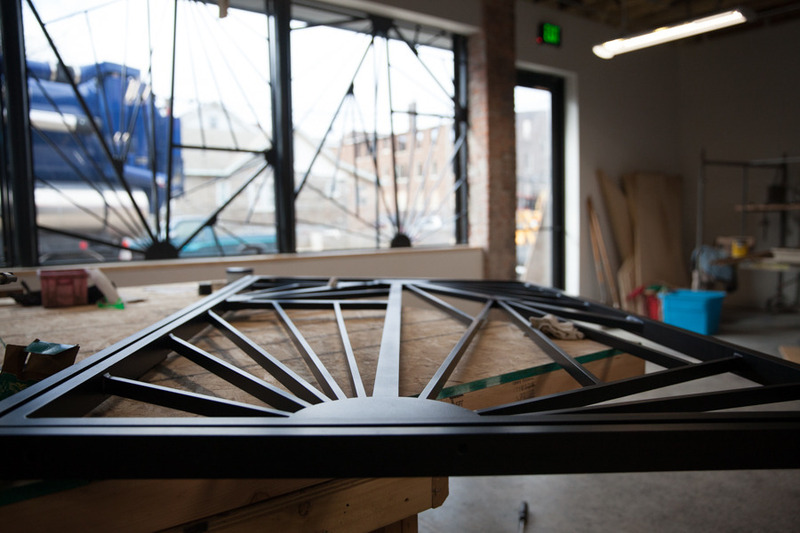 The second panel features variations in the gauge of the steel as well as half circles plates to help visualize the finished product as it will appear in its final form. Today Mav from Motor City Street Dance Academy stopped by before the construction meeting to see building updates and also shared some feedback from his impressions of the panels.